One autumn day in 2010, I was at the Smithsonian Conservation Biology Institute, (SCBI) and I met Brian Gratwicke. 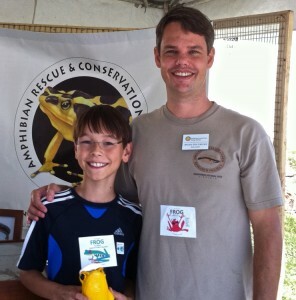 Brian is a frog expert, a herpetologist, and is working in Panama to save frogs from a deadly fungus. The fungus is called chytridiomycosis, or chytrid. Brian told me of one cure for the chytrid fungus. It is a bacterium, called Janthinobacterium lividum. J. liv. for short. He said that the cure can come off the back of some redback salamanders, (Plethodon cinereus) which I realized, live in my back yard in northern Virginia. He said that it was kind of rare to discover the salamanders that have the bacteria on them. You need to swab the salamanders, and streak the bacteria on their backs onto agar plates. He said that if the salamanders carry J. liv., a milky purple spot will appear on the plate, that you can’t miss it. I told him I am very interested in herpetology, and that I could the do the experiment by the winter. So that is when I decided to try and find Janthinobacterium lividum. Brian said it was a great idea, but he would be very surprised if I found J. liv. I started with a question. My question was; is J. liv really on the backs of the redback salamanders in my backyard? To perform the experiment, I needed some supplies. I got petri dishes, agar, sterile swabs, distilled water, gloves, a plastic terrarium, my camera, and an instruction book (on how to prepare and streak petri dishes). Soon I had my lab set up. I microwaved the agar until it was completely liquid. Then I carefully lifted up the lids of the petri dishes, and poured the liquid agar in. I labeled them from one to ten. I put my gloves on, and got the terrarium. I was ready to catch some salamanders. Soon I was outside on the lookout for anything that was small, and that crawled. I went to my backyard and started looking. I looked under logs, rocks, and bricks. After many false alarms with large earthworms, I came across a redback salamander. I picked it up with my gloves, and put it in my terrarium. Then I ran back inside. I set down the terrarium and began my work. 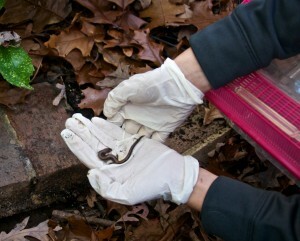 I used my supplies to swab the salamander, and photograph it. I then returned it to its log, and started looking for another salamander. After the next few weeks of hard looking, I had done this for all my ten of my petri dishes, with salamanders, collected from different locations. I just needed to wait for the bacteria to grow. I waited for about three days. By then, the color started to appear on the petri dishes. On dish number one, there were orange and clear colors, but no purple. It was the same for all the next eight. On petri number ten, things were different. It took much longer to culture bacteria on it. Pure cultures of purple bacteria, the purple comes from the anti-fungal chemical violacein. After three additional days, I saw it. In a small spot in the middle of the petri dish, was a milky purple spot. I couldn’t believe what I was seeing. I had found the bacteria. 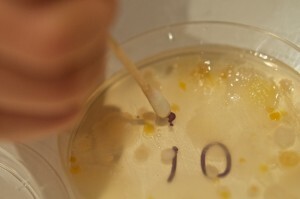 I took photos of all the petri dishes, and wrote the dates that the color appeared on them. I took many photos of the purple J. liv. colony. I was so happy. It was very lucky that I had found J. liv. After I found the bacteria, I bought two more petri dishes. I took the original J. liv. culture and swabbed it. I then streaked the new agar plates with J. liv. I waited. Within three days, the color started to appear. 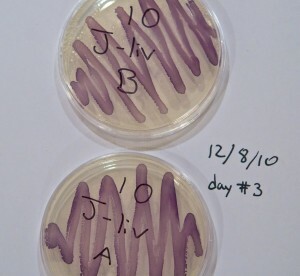 The whole agar plates were covered in the milky purple J. liv. I wrote down my observations. I could culture and grow J. liv. in gigantic amounts. I found Janthinobacterium lividum, and I was proud of myself. I couldn’t wait to tell Brian Gratwicke! –Tom McCarthy, 6th grade Chesterbrook Elementary School in McLean VA. This entry was posted in chytridiomycosis and tagged 6th grade Science Project, Cure by admin. Bookmark the permalink.